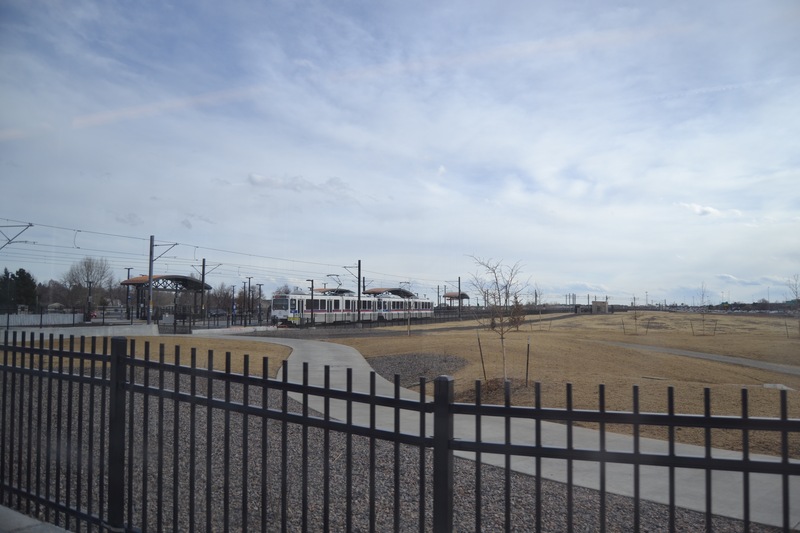 RTD’s R-Line opened to the public last Friday, and while a new light rail route through Aurora is a positive step forward, it’s also not without flaws. Some shortcomings are a result of decisions made long ago and will be tough to fix, but they can be remedied. First, the basics: The R-Line completes a missing light rail link between north Aurora and south Aurora. It connects to the A-Line at Peoria Station and the H-Line at Florida Station, adding flexibility for people heading in the direction of either downtown or the airport. The R-Line’s southern terminus is way down south in Lone Tree. It comes every 15 minutes most of the day, and every 30 minutes before about 6 a.m. and after about 8 p.m. I rode the new Aurora line yesterday during afternoon rush hour. Here’s what I found. Transit works best when stations are surrounded by walkable development — places where people live, work, and do business just a short distance away. If people can walk to the station, more people will be able ride, the system will be able to serve a wider variety of trips, and fewer people will drive to get around. But like much of RTD’s rail network, the R-Line covers a sprawling distance (22 miles) without always serving walkable areas. That’s a result of decisions made long ago by RTD and local governments to build rail along freeways. As a result, most of the R-Line’s 16 stations (eight are new) are surrounded by parking lots, the I-225 and I-25 freeways, and/or other wide, arterial roads. Industrial warehouses, big box stores, and large swathes of open space also surround several stations, with single-family homes and business parks in the distance. The R-Line’s Fitzsimons Station serves the huge University of Colorado Anschutz Medical Campus with a free shuttle operated by CU. Colfax Station will serve the impending Veterans Administration Hospital, though the trek from the station won’t be easy for everyone because the pedestrian infrastructure is not up to snuff. 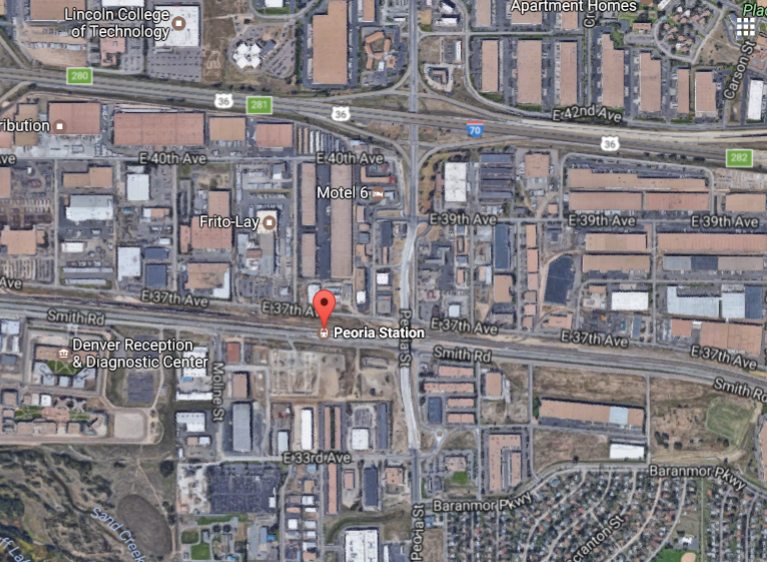 The sprawling shopping center near Aurora Metro Center is destined for redevelopment as well. 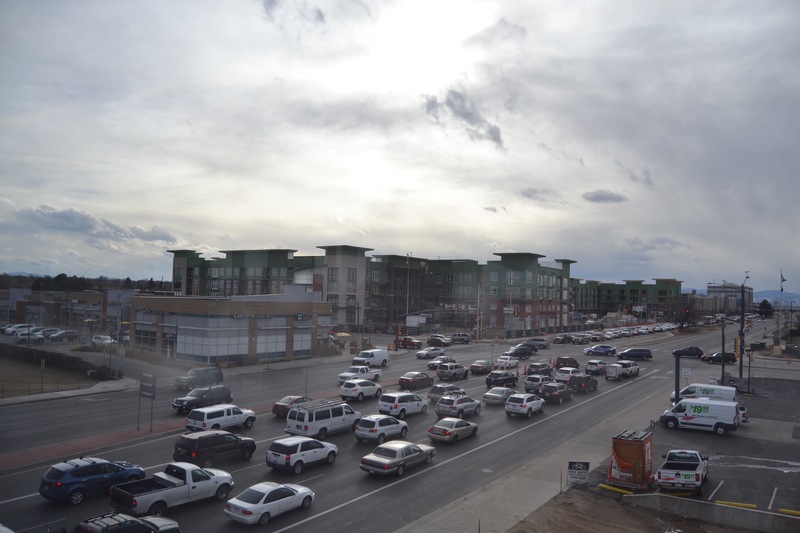 Aurora officials have zoned the areas around stations to attract walkable development. The R-Line corridor is expected to grow by about 39,000 residents and 37,000 jobs in the next 18 years, according to an RTD analysis. But where will they live and work? From the window of the train, some new mid-rise homes with ground-floor businesses are emerging near Colfax Station, but otherwise, evidence of transit-oriented growth nearby was scarce. Adding to its reputation for putting cars first, RTD has no buses — none — serving the 13th Avenue Station (the CU shuttle is the only “bus” serving Fitzsimons). Only a few bus routes get riders to the eight new stations with service that arrives every 15 minutes or less at any point in the day. As with most RTD stations, surface highways and interstates around the stations make walking or biking to them unsafe and inconvenient, though some stations fall on a recreational trail network. For the most part, parking a car is a piece of cake, as usual. There are 6,556 parking spots next to R-Line stations — about 1,800 of them built for the eight new stations. (Though in a rare move, the 13th Avenue, Florida, and Fitzsimons stations have no RTD parking lots.) If you’re riding to the train, meanwhile, there are just 146 bike racks and 103 bike lockers at all the stations combined. On my trip, the train made two stops where the tracks intersected with car traffic, adding up to about five minutes of delay. Giving the train priority at signals could shave some precious time off trips. This article was changed to reflect the fact that Florida Station has no RTD parking lots, not Colfax Station as originally reported. I typically make it a policy to not comment in/on media on Aurora news (so I won’t offer any analysis), but I will offer a minor correction: 13th Avenue has parking, Florida does not. Anthony – why the mysterious “statement of policy”? Either say why Aurora news doesn’t deserve your analysis, or just offer your correction and leave it at that. David – Colfax station has no parking, either (the stations with no parking are Fitzsimons, Colfax and Florida). I work for the city so I don’t like to make statements or analysis on non-city websites or at non-city events that could be mis-interpreted as official policy. So it’s not a matter of not deserving my analysis or time, it’s a professional self-restriction to maintain communication on city matters through official channels. Just imagine what RTD could do if they hadn’t spent all of this money buying property for and building parking. They could have built a lot of sidewalks for one. If you want to get suburban commuters out of their cars onto light rail then providing parking is a good idea unless you are aware of a plan to solve first mile/last mile issues? Bus service in Aurora is spotty. I sometimes get confused with priorities ’round here. With respect to the new segment thru Aurora that was just opened, of the 1800 spaces, Aurora owns 600 at Iliff Station and 550 are at the Peoria Station. Being familiar with the Iliff Ave corridor and since Iliff Station is a ten minute drive from Nine Mile which is full by 7:00 AM, I would expect it to be well utilized. BTW, it’s not the least bit difficult to develop surface parking with a TOD when demand warrants. There’s plenty of info on how providing parking doesn’t actually help ridership. The first step in fixing first/last mile is making sure that people can walk it on complete and adequate sidewalks. That only works if you have the requisite density to begin with but doesn’t solve the problem for most suburban commuters; but if you’d rather have them drive…. Consider that when Miami opened its 1st (heavy) commuter rail line the ridership was sparse including sidewalks I’m sure. Thirty years later it’s now quite impressive. In other words Rome wasn’t built in a day. Textbook urbanism doesn’t yet exist in the suburbs but oftentimes patience is a virtue. It might help to locate transit in areas that already have denser development, instead of along freeways. It’s going to be much harder to develop around stations with the freeway right there. It also cuts off access to half of the area that should be walkable distance to a stop. Yes,it was easier to build along the highway, but will it serve as many people? Don’t disagree although I also understand why they did what they did. Aurora is a tale of two cities. Either you live in Cherry Creek School District or you live in Aurora School District. People live in CCSD bcuz they can afford to or bcuz they want their kids to go to the best run school district in the metro area. CCSD has failed to pass a bond issue only once in the last 55 years. West of I-225 CCSD runs from as far north as Mississippi down to Parker Rd. East of I-225 CCSD runs from Hampden south to the county line and east to Cherokee Trail High School just south of Aurora Reservoir. It has an impressive football stadium that serves as a bookend to the Stutler Bowl at CCHS east of the tech center. There is an impressive amount of affordable housing, especially north of Smoky Hill Road and has a Yuge variety of demographics and socioeconomic levels. If you have a child with disabilities, either learning or physical then CCSD is the go-to place. The 1st station on the south end of Aurora, Nine Mile Station, was built with the SE T-REX project. Not counting the new A LIne, Nine Mile has the best ridership outside central Denver and is 7th overall. Cars start pouring into the 1225-space parking garage at 5:00 AM and if you can find a spot after 7:00 AM you got lucky. Across Parker Rd the Regatta Plaza will be jointly redeveloped into a mixed TOD by Rod Thorn (Mile High Dev) and Koelbel & Co. Where King Soopers currently sits will become an RTD overflow lot once they move to the north side of the site. At the next and 1st new station, City of Aurora owns the Iliff Station two-level 600-space parking garage and will charge $3 per day or $50 for a monthly pass. Between ease of access and a more pleasant experience, guessing that many will be happy to pay to avoid the Nine Mile Station clustermess. The popular H LIne into downtown will now end at Florida where you can walk across the ped bridge to the Aurora Medical Center complex. The word is because. Not bcuz. 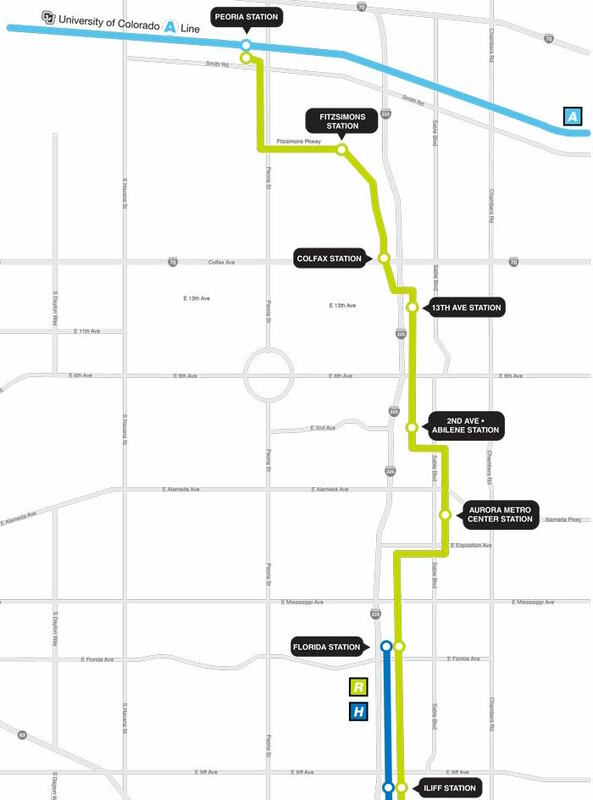 Rtd could have put a 10 foot regional trail along the entire alignment. But didn’t. So…It almost worse than a road.